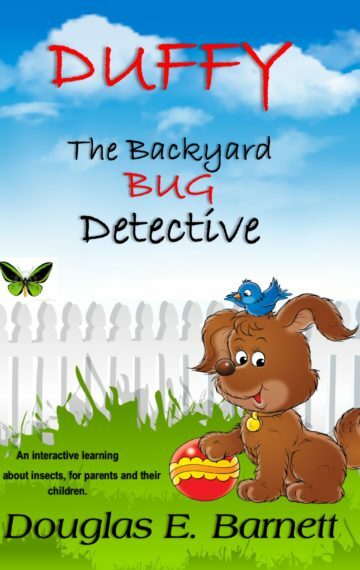 The narrator of this children’s book is DUFFY, a puppy that plays in the backyard and finds all kinds of insects to share with the children who read this book. The book is interactive, in that it provides an interesting and creative way for parents to enhance their children’s reading skills, while teaching them the actual details about the world of insects. Both are transferable to their school environment. ABOUT DOUGLAS E. BARNETT: Douglas Barnett is a native of Arkansas, who graduated from the University of Kentucky with a PhD in insect systematics. He retired from a career with the Federal government in the U.S. Department of Agriculture, International Services, in 2006 and now resides in Monterey, Tennessee with his wife, Eileen. Doug’s interest in photography began when he was a small boy, amazed at nature’s mysteries all around him. His interest grew, developing into a serious pursuit in college and during his career. It became a passionate hobby in retirement. Doug never lost his child-like fascination with the wonders and beauty in nature. He has now published this book, so that other children can learn about the amazing things nature has to offer…hidden in their own back yards. He has also published in a number of scientific journals and technical publications. His desire is that this book and perhaps others to follow may fascinate children in the mysteries and wonders of science. Doug’s hope is that this book will be used by parents to foster early reading and understanding of the written word, through the colorful images presented. Perhaps, it will engender their further reading and exploration of the scientific world. You can communicate with Doug at… dbarnett9@frontiernet.net.